Performance will change as the game continues to be patched. It appears that the game is using slightly more than 2GB of VRAM even on low settings, which results in a lot of stuttering for that big majority of us with 2GB or less VRAM. As you move around the map and look at different things, as data is paged into memory when different assets need to be loaded. 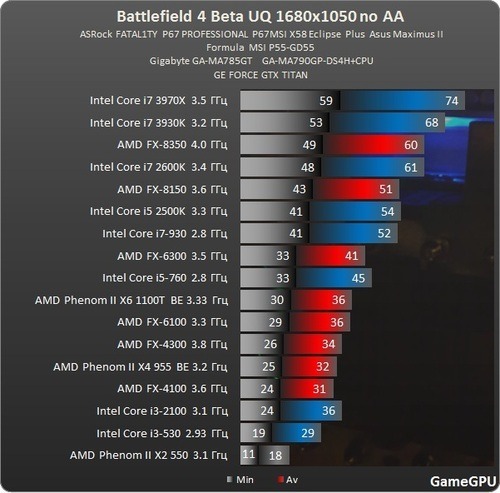 The benchmark data is still useful and gives us a good hint of how to build a PC for Battlefield 4, since the basic game engine is not going to change significantly. The game looks fantastic, and It’s obvious that it needs a lot of power to run well. A modified Great tier build, with the FX-6300 removed and replaced with the FX-8350 would be a great budget build, and the most inexpensive I would recommend for BF4 at 1080p resolution (1920 x 1080). Go with the HD 7870. AMD 7000 series cards are a particularly good bargain right now, because they are trying to clear them out for the new R7 and R9 series cards. Skip the slower i5’s of the Superb tier. Normally an excellent value, they won’t do as well in BF4 as the less expensive FX-8350. The other upgrades of the Superb tier would be worthwhile though, especially an SSD. You will continue to get better performance moving up the rest of the tiers. 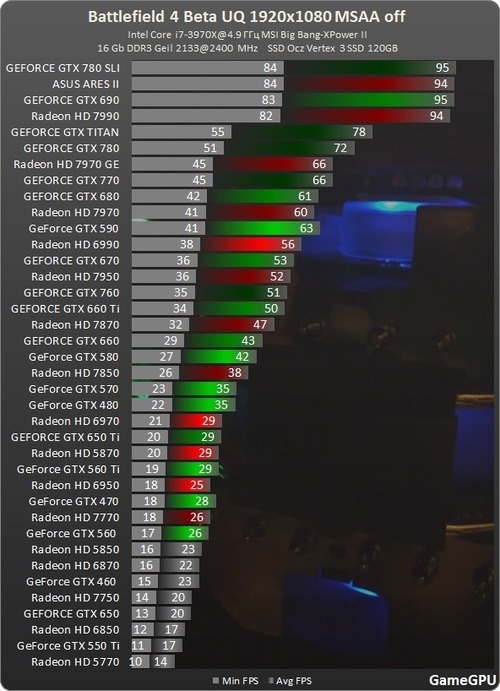 AMD graphics cards continue to be the better value. Good solid ~ 60 FPS maxed out at 1080p won’t come until all the way up around Outstanding / Exceptional, and will require at least a GTX 770 or HD 7970 GE. You could also replace the Intel i5/i7 CPU and Z87 motherboard with the AMD FX-8350 and suitable socket AM3+ motherboard, and get similar performance. If you’re planning on playing at greater than 1080p resolution, then you’re going to need some serious graphics hardware. Dual 7970’s or GTX 770s or better are recommended. One more recommendation: I’ve seen reports that BF4 performs significantly better on Windows 8 (as much as 85%!) This will improve with patches, but how much is unknown. Feel free to ask if you have any questions about a new BF4 build, and please let me know if any of this information becomes out of date!